I’ve been meaning to get around to posting Blackhawk Plaza for some time. 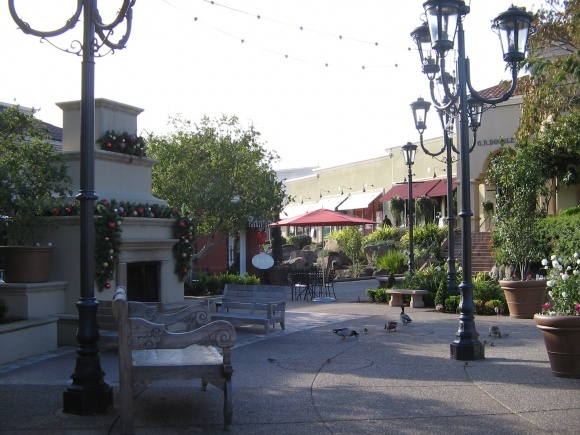 Blackhawk Plaza is one of the weirdest malls in all of California–an excessively upscale, kind of dead-ish small outdoor mall that’s unfailingly pretty. I really wish all lifestyle centers were this nice, and I hope this place is someday able to find the success it mostly deserves. 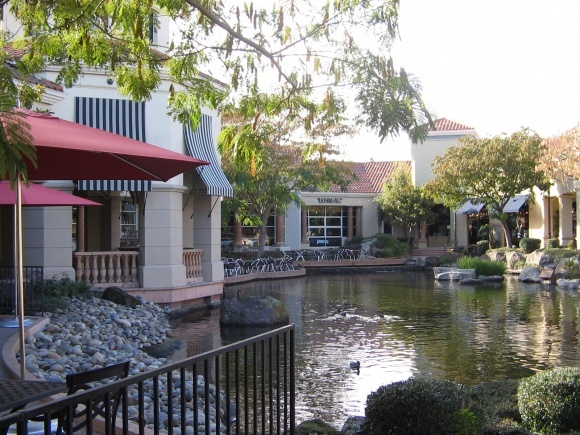 In the meantime, let’s dig in, and make sure you stop to check out some of the pretty pictures since this is an extremely attractive shopping center. 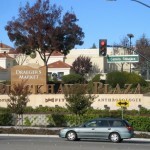 Blackhawk Plaza was devised as part of a plan to generate a commercial center far up in the hills and well off the freeway. 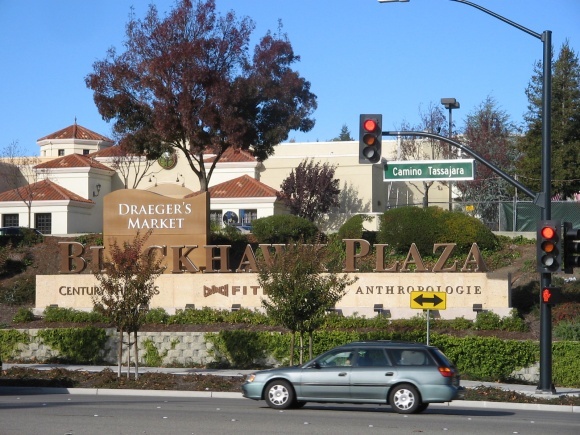 Unlike most large shopping malls which locate near a freeway to serve a large geographic area, Blackhawk was intended just to serve the affluent suburbanites nestled in the removed area east of I-680. 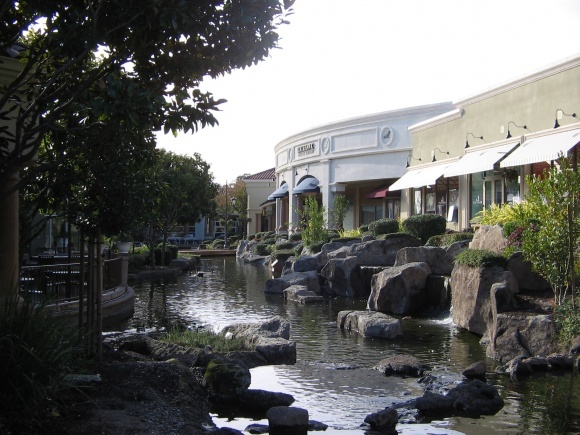 As a result, it’s a fairly small shopping center with just around a quarter of a million square feet, but the developers made up for size with attention to detail. 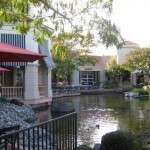 Most of the center shares some of the architecture of the surrounding area, setting a series of buildings around a man-made brook, with the main pedestrian walkways criss-crossing the brook for the length of the mall. 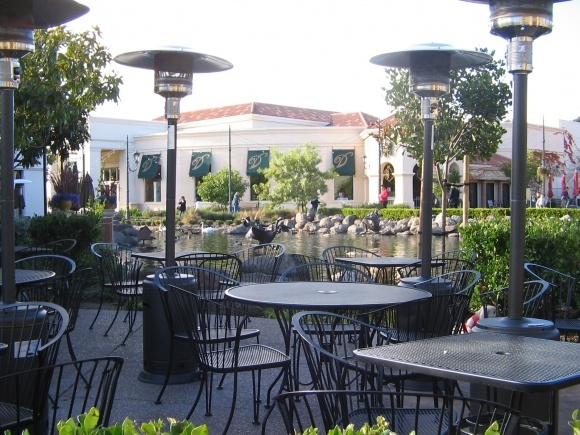 There are ample spaces set aside for outdoor dining, as well, to take advantage of the mostly favorable and warm climate of the area. As Scott at BigMallRat calls it, it’s like a little man-made San Antonio. Also, people seem to really like feeding the ducks here. They also seem to not really like spending much money. 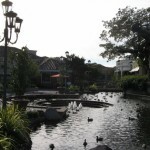 The architecture is unsual even beyond the beautiful (by mall standards, anyway) lagoon. 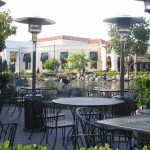 The southern side of the center looks like a more typical enclosed mall, with stores on both sides and a roof on top, and the stores on the side closest to the lagoon mostly have outdoor patio spaces reserved for dining. 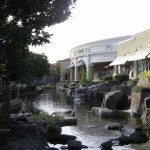 The other side of the center faces the lagoon directly, with a walkway between the stores and the lagoon. 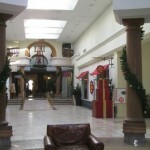 There are also stores on all sides facing the parking lot and some outparcels such as a movie theatre. At the mall’s eastern end, there’s a rather unusual anchor: a large automobile museum. There’s also a wheelchair foundation office, mysteriously up a large set of stairs (??). And that leads us to the rub. 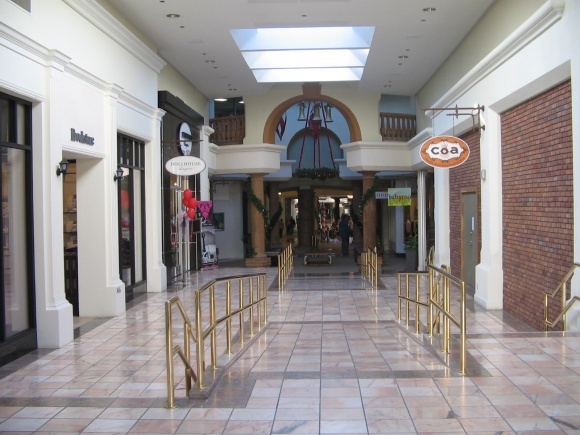 When Blackhawk Plaza was opened, most of this area was still pretty sparsely built, and as noted earlier, it was designed as a somewhat insular shopping mall meant for the surrounding neighborhood, not for the region on the whole. 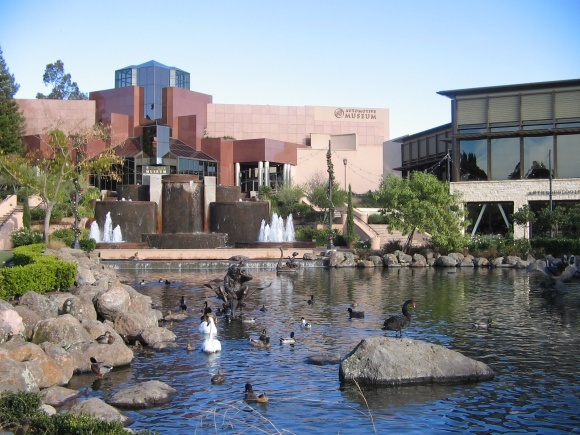 This meant there wasn’t quite the critical mass of population to support the kind of mall they built with Blackhawk, and as a result the center has spent two decades being plagued with vacancies and weird occupancies. It’s also had a significant shuffle of anchors in its tenure: initially, Bonwit-Teller was supposed to anchor the center, but they pulled out before the store was ever built. 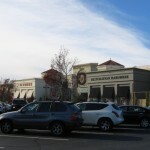 Instead, the initial anchor was Blackhawk Market, an upscale grocer that even had cell phones attached to each cart (weird? ), but they went out of business. I wonder why. 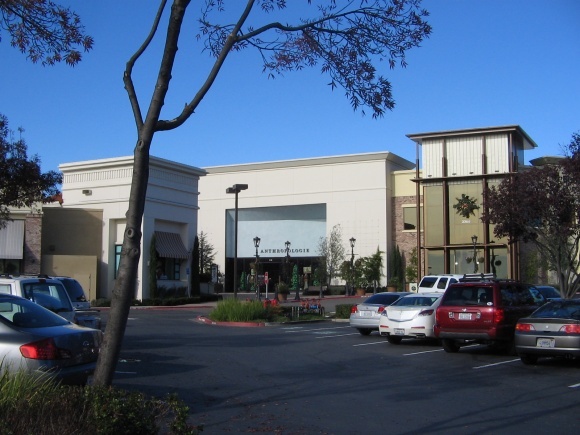 They were replaced by Saks Fifth Avenue–a real boon, and a more typical anchor for a center like this (and in fact, the only Saks located in the East Bay), but they were a colossal failure, closing after only six months. 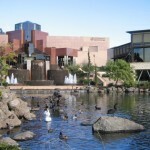 They were replaced by Fresno-based Gottschalks, a significantly frumpier but more sensible alternative, but Gottschalks was bizarrely and unceremoniously booted out in favor of local upscale grocer Draeger’s, who anchors the center now along with the auto museum, a Crunch Gym, and a large Century Theatres. 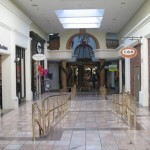 In the past two years, since we first visited, the mall has shown some significant signs of life, however. 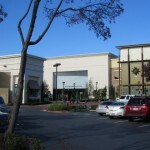 Increased development south of the mall in San Ramon increased the population of the area significantly in the 2000s, helping justify a new class of tenants in Blackhawk’s location. 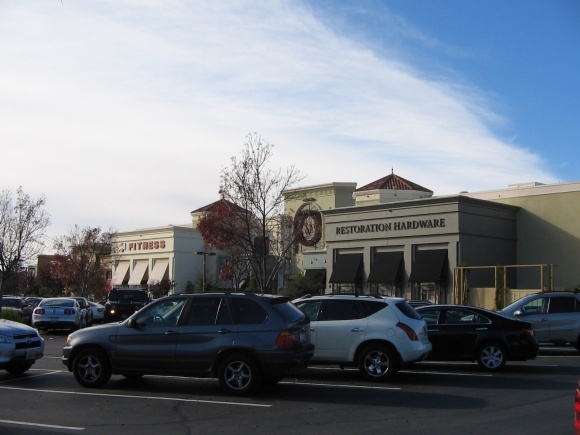 Many big-name national tenants, including Anthropologie, Restoration Hardware, Brookstone, and See Jane Run, have all moved into the center, and many high-quality local tenants such as read. and a handful of restaurants have also taken up space inside of the center, and this is all in spite of the condition of the economy and the fact that the surrounding area hasn’t exactly escaped the foreclosure crisis. The blend of everyday tenants (a market, a gym, a theatre), upscale fashion-oriented retailers, and local bistros certainly seems to make sense given the center’s style and location, but the tenant mix remains bizarre due to things like the auto museum (which may well be legitimately neat, I’ve never been inside) and the wheelchair foundation. 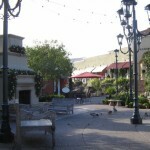 I give the center’s developers credit, though: Blackhawk Plaza is an unusual mall that attempts to run with a unique formula–to create a genuine community gathering space for an area that would otherwise have none–and they’ve succeeded at least in part. 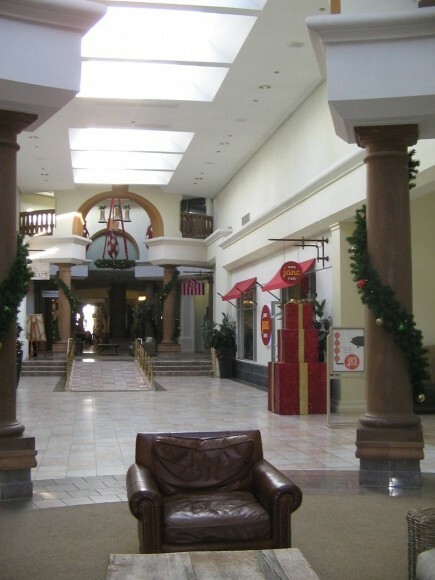 I hope the trend over the last two years continues, and the mall’s fortunes continue to improve. Ah yes, Proposition 8. I don’t want to discuss the actual Prop 8 here, but it does kind of show the questionable nature of free speeches on malls. On Blackhawk Plaza, however, which is what I would like to discuss, Blackhawk Market overestimated the affluence of the area in a ridiculous over-the-top 80s way. I recall reading an article online about how they had stuff like over a dozen varieties of truffles (which, in case you don’t know, market at a few hundred dollars per pound). 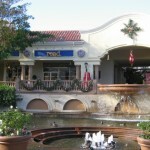 If this center had a younger cousin, it would have to be Dos Lagos in Corona California. 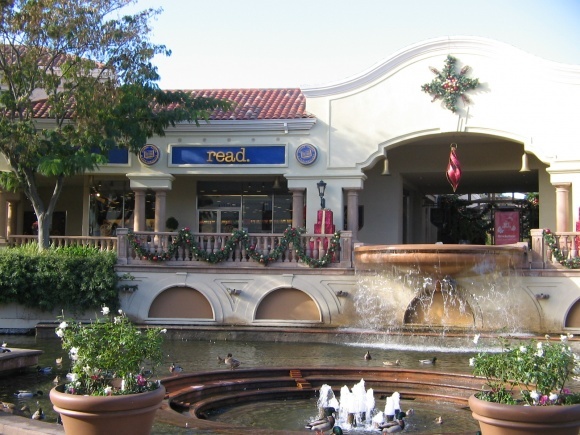 Built as an upper class alternative to other centers its failing bad. 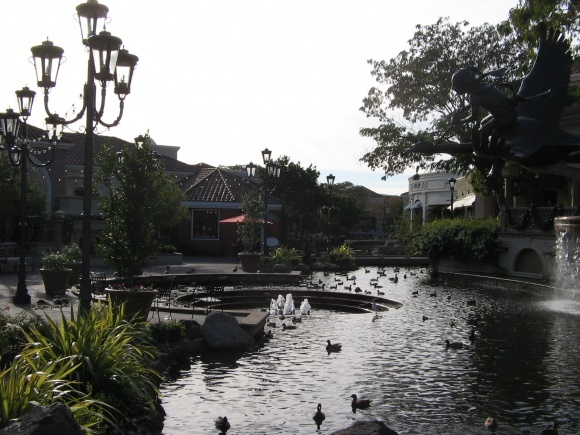 It may not have the nice lagoons and walkway, it did have a market (trader joes) a theater (which already has become a discount house after a year) and restaurants around the lakes. This center was built in the middle of nowhere but off the interstate. Us regular Joes love to go to Blackhawk Plaza and bring our other middle class visitor friends just to experience an upscale lifestyle for a few hours. 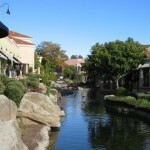 Fantastic restaurants on the water, a neat museum and theater, and an over-the-top grocery store. Just as we go there, some of the richest people who live in the gated community shop at Target and consignment stores, etc. 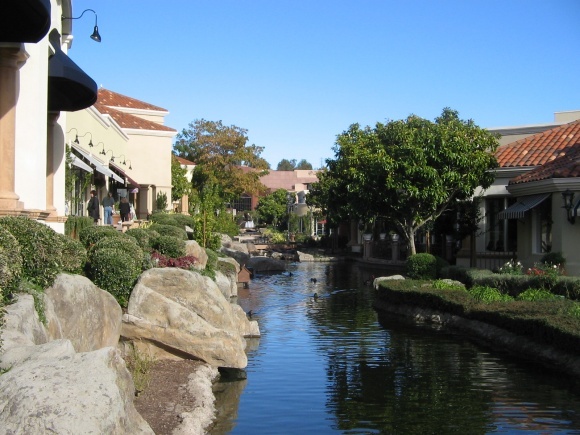 Dublin, California style. (we figure that is why they have so much, because they don’t want to spend it). So many stores have tried to make a go of it here and couldn’t. Worth a visit to see how the other half live. And don’t forget the open houses on the weekends where you see miles of mac-mansions.